A depth chart for next year, sorta. 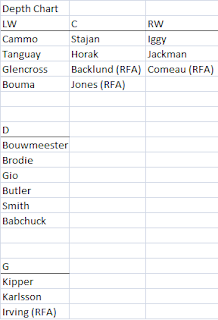 RFA's are ranked lower than signed guys by default. 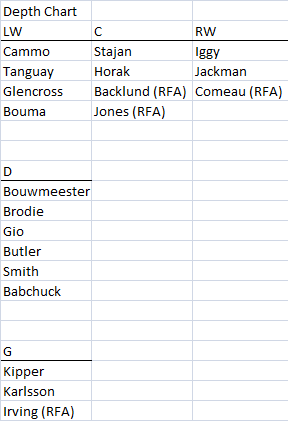 Tanguay could be flipped with Glencross as the clubs second best LW. Hell, the way he played before he got injured, you could argue he should be ranked in the one spot. Other than that...it shouldn't be too controversial a representation. This club has glaring depth issues. I don't see any top six centres. I only see one top six RW. I think you could live with Cammo, Tanguay, Glencross, The defence needs an upgrade. Hopefully the club is able to move Bouwmeester in the offseason, and address the glaring salary structure issues his contract/production create. That's depressing. They would need to bring in a quality top six RW, two top six Centres, a top pairing D guy (or two if they trade Bouwmeester). The cap will rise, and it looks like the club will have around 20 million dollars to spend in the offseason. But that's a minimum four guys who are probably going to cost that the club would need to bring in if it wanted to legitimately sell the hope that it was a contender. No. European mercenaries are not the answer, I don't think. Anyway, this team looks like it could be fucked. And teams in fucked positions sometimes do fucked up things. Which is going to be fun to chronicle, no doubt.